Most of my favorite Italian white wines come from the Alto Adige, the German-speaking region in the far north-east of Italy, just south of the Austrian border. Dieter Sölva is a young winemaker from the tiny village of St. Nikolaus, high up on the west side of a majestic valley that leads north through the Dolomites. The altitude of these vineyards gives the wines an excellent backbone of acidity, even in the atypically hot 2003 vintage; the white wines are vinified in stainless-steel with no malolactic fermentation and no oak, allowing the wine to show the true flavors of the earth. It is very typical of the region that the wines are impeccably clean (Dieter is a graduate of the famous enology school at San Michele, as was his father before him). Here is a link to their web page http://www.niklaserhof.it/. From the Oxford Companion to Wine: "the great success story of modern German vine breeding...bred...in1969...from red parent Trollinger (Schiava Grossa) X Riesling. The large white berries produce wines commendably close to Riesling in flavour except with their own leafy aroma and very slightly coarser texture." 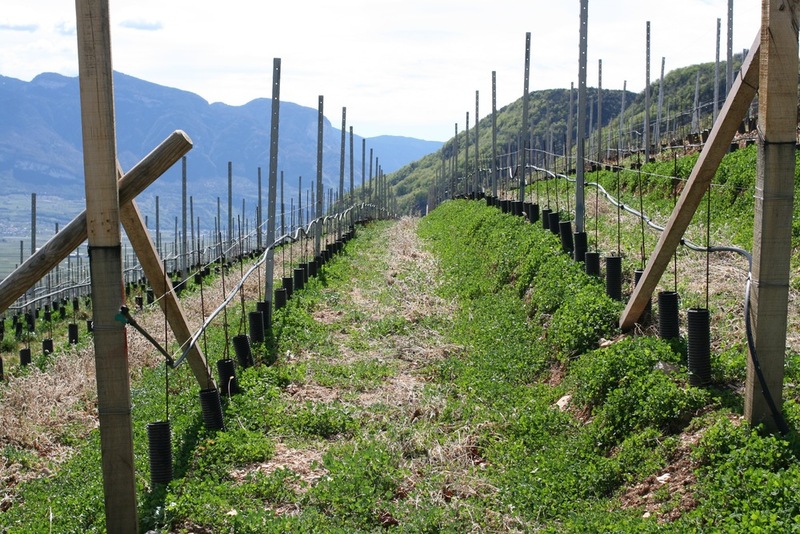 Dieter Soelva's father, a well-known viticultural consultant in the Alto Adige, brought the variety from Germany in the 1970s. Thus, the Niklas family vines are the oldest Kerner vines in the region. Dieter's bottlings are vivid, minerally, and as Jancis Robinson rightly observes, show a distinctive herbal quality. Pinot Grigio is the best-selling Italian white wine, but the truth is that Pinot Bianco almost always makes better wine than Pinot Grigio in northern Italy. Dieter's example (labelled 'Weissburgunder,' the German name for the variety) is minerally, intense, appley, and slightly herbal. It is not as extroverted as the Sauvignon, but it is every bit as good. It is an excellent food wine, and I often drink it as an aperitif. This is top-notch Sauvignon. It displays musky aromas coupled with ruby-grapefruit and herbal notes. On the palate, it display fresh acidity typical of the variety and an excellent minerally streak behind the ripeness. Vinified in all stainless steel, with no malolactic fermentation, the wine lingers with freshness and is a perfect complement to grilled seafood. I had been buying excellent Sauvignon, Kerner and Lagrein from Dieter Soelva at Niklaserhof for ages. 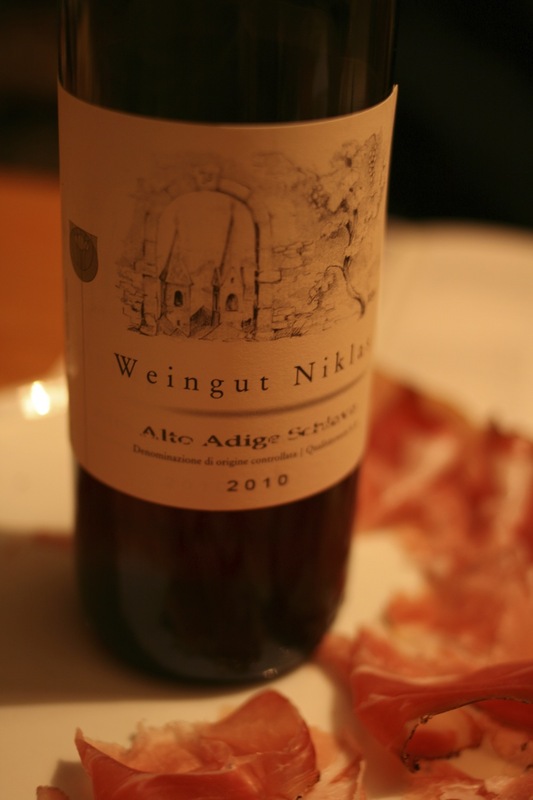 Every April I would visit Dieter and taste* his excellent light red wine, traditionally called 'Kalterersee Auslese,' and reluctantly decide that however much I liked the wine, the world was not yet ready for an Italian red wine with the word 'Auslese' on the label. Then I found out that the wine could also be labelled with the Italian name of the variety, Schiava, and there was no reason at all not to import it. Fortunately there has been a marked increase in appreciation here in California for lighter, food-friendly red wines, and even a growing appreciation of Schiava, which produces one of the closest Italian equivalents to Beaujolais. Dieter's Schiava is made of two different types of the Schiava variety (also called Vernatsch or Trollinger) from the vineyards around Lake Caldaro, in the South Tyrol. It is all stainless steel vinification. Pale red in color; aromas and flavors of fraises do bois, herbs, and orange peel. This is a very versatile red wine, particularly in warmer weather; great with cured meats (especially the Tyrolean specialty, Speck), pizza; or grilled chicken, pork, or salmon. Best drunk at cellar temperature, or after 30 minutes in the fridge. Lagrein is an indigenous grape variety that is used to make a wide range of different wine styles, from rosé ('kretzer') to huge, black-purple reserve wines. Dieter Soelva's example is in the middle, a delicious plummy savory drink with a hint of tannin on the finish and no noticeable oak (it does spend some time in larger neutral wood). These middle-weight Lagreins (that of Thurnhof is very similar) remind me somewhat of ripe Cabernet Franc from the Loire, and they are very useful table wines. It will keep for at least 3 years beyond release but in my experience is best drunk young.